This morning I am heading over to Foxtale Book Shoppe (think “Cheers” with books instead of beer) to sign up for an eight week writing class. I take these classes a couple times a year, mostly because I love being around the quirky, cool, creative folks that tend to participate. Although I primarily share the first adjective with my fellow writers, being in their presence stretches me out of my comfort zone and spurs me on to greater creativity. In preparation for the upcoming class, I pulled out my composition book (secretly hoping it was full so I could buy a new one – I am addicted to office supply stores!) and saw a silly little ditty that I wrote in the previous class. The assignment had been to write a paragraph or so using the following words: jaunty, jauntily, bird, himself, and tread. Here (complete with illustrations) is what flowed from my pen. tread up and down the rail. and fanned his fancy tail. on corn and nuts and seed. and tried to fly away. so he squatted down and squawked. he became a meal for a hawk! Take care where you jauntily tread. or you just might end up dead. By the way, this poem is only slightly far-fetched. 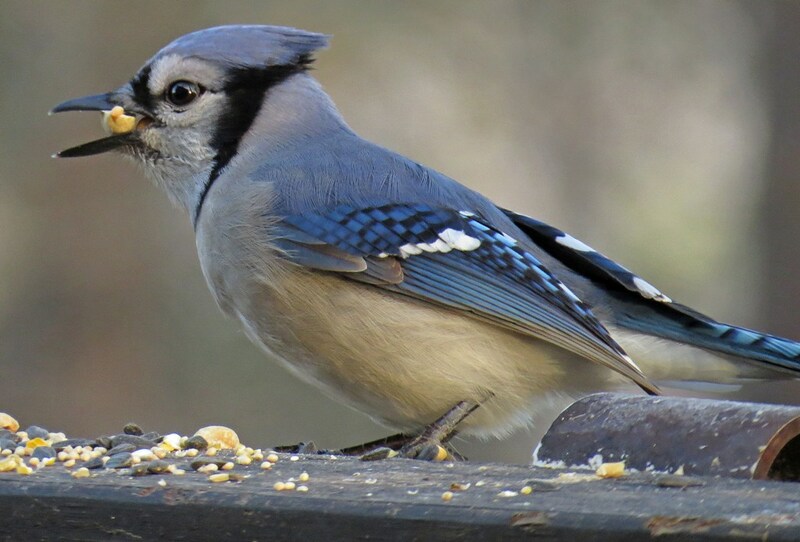 Blue Jays have an expandable throat pouch, and I have seen one pack away thirteen shelled peanuts in one sitting! 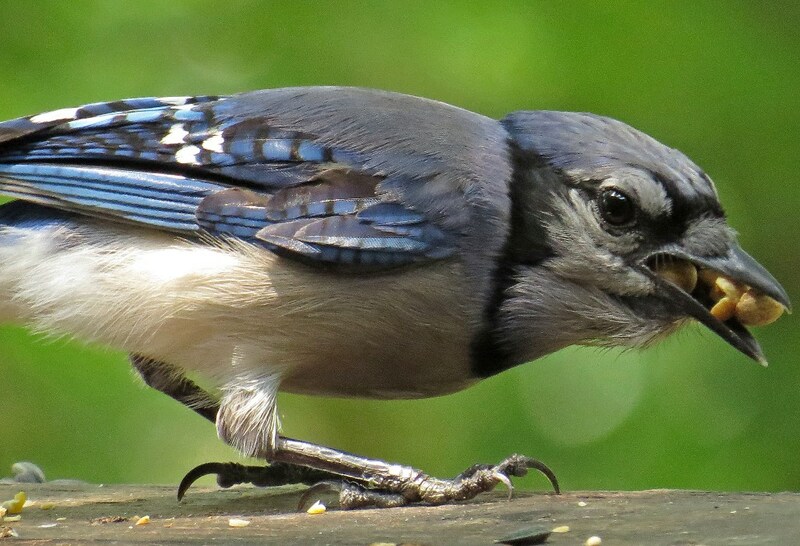 This entry was posted in Backyard Birds and tagged bird photography, birds, blue jay, nature, photography, poetry, wildlife, writing. Bookmark the permalink. Again, thank you Kathy. These posts make my day in two ways. First, I love watching birds, but do not have the time to watch as much as I like. The shots you take, I can stare at for a bit even when I am on the road and imagine my own back yard. Secondly, I (we all) are exposed to so much critical negative posts and articles, it is so refreshing to read such creative posts about nature’s beauty, beautifully written. And not just this poem. Inspiring! I was laughing out loud by the end of your poem! And so true about the Blue Jay and food. I wasn’t aware of the expandable throat pouch, but I’ve seen them at my suet consuming an unbelievable amount. And they look so funny with the suet stuck all over their beaks! Lovely post. Keep it up! Thanks for the encouragement. 🙂 And with great joy, I will keep on posting! Who knows, perhaps one day I will do some sort of bird/poetry/whatever else strikes my fancy kind of book. But I definitely want to know when yours is published. Keep me posted! I loved this poem, and your photographs are perfect for it. The perfect balance of humour/important moral is great! Great prose! Loved the poem and the photos. Have fun in your writing class! You are certainly very gifted! If we lived close to one another, I’m sure we would be the best of friends! !